A whimsical mix of watercolour and paper cut-outs enhances this rhyming book for 3–6 year olds. Erik wants a cuddle. His dad says it’s something echidnas soon learn to do without. Erik sees koalas snuggling and rosellas with their wings around each other and he’s ready to curl up and cry. Running away doesn’t solve his problem: soon he’s pursued by snakes, bees and birds of prey. But——wait! They’re deterred by his spikes. Yay! 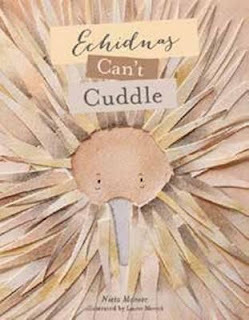 And on his safe return, Erik discovers even better news—echidnas might not be able to express their affection through cuddles but there’s nothing to stop them kissing. This is an all-round charmer of a book.